Reading and share top 1548 famous quotes and sayings about Snow by famous authors and people. 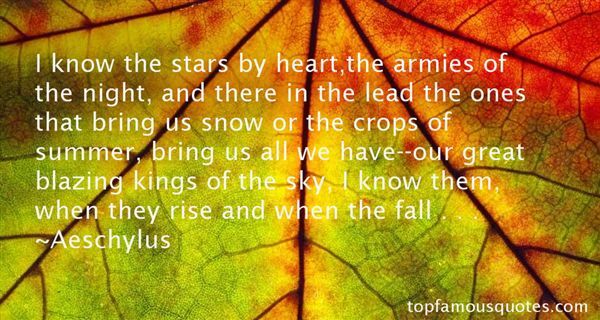 Browse top 1548 famous quotes and sayings about Snow by most favorite authors. 1. "I know the stars by heart,the armies of the night, and there in the lead the ones that bring us snow or the crops of summer, bring us all we have--our great blazing kings of the sky, I know them, when they rise and when the fall . . ."
2. "As tiny silver flakes drifted down to settle on our bodies---Both the living and the dead---I thought perhaps the moon had hidden her face from us, as full of sorrow as we were. But she couldn't stop her tears from spilling out in the form of silent snow." 3. "Could two live that way? Could two live under the wild rose, and explore by the pond, so that the smooth mind of each is as everywhere present to the other, and as received and as unchallenged, as falling snow?" 4. "In nature, improbabilities are the one stock in trade. The whole creation is one lunatic fringe. If creation had been left up to me, I'm sure I wouldn't have had the imagination or courage to do more than shape a single, reasonably sized atom, smooth as a snowball, and let it go at that." 5. "Did dreams, he wondered, when they arrived, make a sound? The smallest kind, like the noise of an embryo being conceived, or a snowflake touching down?" 6. "It started when we were little kids.Free spirits, but alreadytormented by our own handsgiven to us by our parents.We got together and wrote on desksand slept in laundry rooms near snowy mountainsand slipped through whatevercracks we could find,minds altered, we didn't falterin portraving hysterical andtragic characters in a smogfilled universe.we loved the dirty cityand the journeys away from it.We had not yet been or seen our friends, selves,chase tails round and round in downward spirals,leaving trail of irretrievable,vital life juice behind.Still, thebrothersbloodcomradespartnerfamilycuzzwas impenetrableand we lived inside itlaughing with no clothes, andeverything experimental 'tilldeath was upon us.In our face, mortality." 7. "Wow, it really snowed last night! Isn't it wonderful? Everything familiar has disappeared! The world looks brand new!A new year ... a fresh, clean start! It's like having a big white sheet of paper to draw on! A day full of possibilities! It's a magical world, Hobbes, ol' buddy ... let's go exploring!" 8. 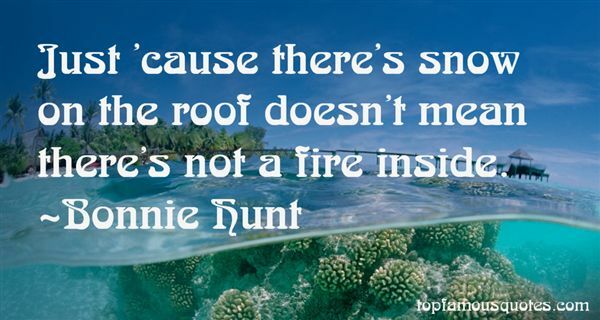 "Just 'cause there's snow on the roof doesn't mean there's not a fire inside." 9. "This is the circus of Dr. Lao.We show you things that you don't know.We tell you of places you'll never go.We've searched the world both high and lowTo capture the beasts for this marvelous showFrom mountains where maddened winds did blowTo islands where zephyrs breathed sweet and low.Oh, we've spared no pains and we've spared no dough;And we've dug at the secrets of long ago;And we've risen to Heaven and plunged Below,For we wanted to make it one hell of a show.And the things you'll see in your brains will glowLong past the time when the winter snowHas frozen the summer's furbelow.For this is the circus of Dr. Lao.And youth may come and age may go;But no more circuses like this show!" 10. 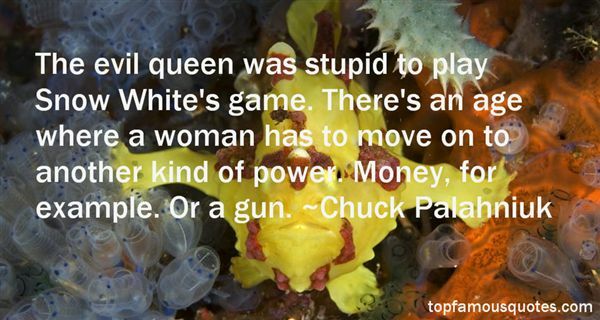 "The evil queen was stupid to play Snow White's game. There's an age where a woman has to move on to another kind of power. Money, for example. Or a gun." 11. "The name Alaska is probably an abbreviation of Unalaska, derived from the original Aleut word agunalaksh, which means "the shores where the sea breaks its back." The war between water and land is never-ending. Waves shatter themselves in spent fury against the rocky bulwarks of the coast; giant tides eat away the sand beaches and alter the entire contour of an island overnight; williwaw winds pour down the side of a volcano like snow sliding off a roof, building to a hundred-mile velocity in a matter of minutes and churning the ocean into a maelstrom where the stoutest vessels founder." 12. "Sorry I'm late. I had to drag some Californians out of a snowbank." 13. "I must say a few words about memory. It is full of holes. If you were to lay it out upon a table, it would resemble a scrap of lace. I am a lover of history . . . [but] history has one flaw. It is a subjective art, no less so than poetry or music. . . . The historian writes a truth. The memoirist writes a truth. The novelist writes a truth. And so on. My mother, we both know, wrote a truth in The 19th Wife– a truth that corresponded to her memory and desires. It is not the truth, certainly not. But a truth, yes . . . Her book is a fact. It remains so, even if it is snowflaked with holes." 14. "Anyone can write five people trapped in a snowstorm. The question is how you get them into the snowstorm. It's hard to write a good play because it's hard to structure a plot. If you can think of it off the top of your head, so can the audience. To think of a plot that is, as Aristotle says, surprising and yet inevitable, is a lot, lot, lot of work." 15. "To enslave an individual troubles your consciences, Archivist, but to enslave a clone is no more troubling than owning the latest six-wheeler ford, ethically. Because you cannot discern our differences, you assume we have none. But make no mistake: even same-stem fabricants cultured in the same wombtank are as singular as snowflakes." 16. "It snowed last year too: I made a snowman and my brother knocked it down and I knocked my brother down and then we had tea." 17. "Emma was doing something nice for Simon? Hell must be enjoying the snow day." 18. "I Won't Fly TodayToo much to do, despite the snow,which made all local schools closetheir doors. What a winter! Usually,I love watching the white stuff fall.But after a month with only shortrespites, I keep hoping for a criticalblue sky. Instead, amazing wavesof silvery clouds sweep over the crestof the Sierra, open their obesebellies, and release foot upon footof crisp new powder. The skiresorts would be happy, exceptthe roads are so hard to travelthat people are staying home.So it kind of boggles the mindthat three guys are laying carpetin the living room. Just goes toshow the power of money. In lessthan an hour, the stain Conner lefton the hardwood will be a ghost." 19. "I? I am the wind,' said Thowra. ‘I come, I pass, and I am gone.' The strange feathers moved up and down, the strange voice said tartly: ‘And are your sons the same?' ‘My son is the lightning that strikes through the black night. My grandson is light that pierces the dark sky at dawning.' ‘Ah,' said the first emu, ‘and we know your daughter is the snow that falls softly from above and clothes the world in white. You want but the rainbow — that is and was and never will be, and is yet the promise of life — and the glittering ice which is there and is gone: then you and your family will possess all magic." 20. "I'm a good Canadian girl. I miss all that good stuff. I miss tobogganing and I miss snowboarding, but I've also learned to surf and I've become a water baby which I used to be relatively terrified of the water and I kayak all the time now and I'm able to run year round on the beach which you can't obviously do in Canada." 21. "I have a realistic grasp of my own strengths and weaknesses. My mind is my weapon. My brother has his sword, King Robert has his warhammer, and I have my mind… and a mind needs books as a sword needs a whetstone, if it is to keep its edge. That's why I read so much, Jon Snow." 22. "After the bone-grinding cold of the lands beyond the Wall, the caves were blessedly warm, and when the chill crept out of the rock the singers would light fires to drive it off again. Down here there was no wind, no snow, no ice, no dead things reaching out to grab you, only dreams and rushlight and the kisses of the ravens. And the whisperer in darkness." 23. "Automn ill and adoredYou die when the hurricane blows in the roseriesWhen it has snowedIn the orchard treesPoor automn Dead in whiteness and richesOf snow and ripe fruitsDeep in the skyThe sparrow hawks cryOver the sprites with green hair dwarfsWho've never been lovedInthe far tree-linesThe stags are groaningAnd how I love O season how I love your rumblingThe falling fruits that no one gathersThe wind in the forest that are tumblingAll their tears in automn leaf by leaf The leaves You press A crowd That flows The life That goes"
24. "What is whiter than snow?' he said. 'The truth,' said Grania. 'What is the best colour?' said Finn. 'The colour of childhood,' said she. 'What is hotter than fire?' 'The face of a hospitable man when he sees a stranger coming in, and the house empty. ''What has a taste more bitter than poison?' 'The reproach of an enemy. ''What is best for a champion?' 'His doings to be high, and his pride to be low. ''What is the best of jewels?' 'A knife. ''What is sharper than a sword?' 'The wit of a woman between two men. ''What is quicker than the wind?' said Finn then. 'A woman's mind,' said Grania. And indeed she was telling no lie when she said that." 25. "Beautiful she is, sir! Lovely! Sometimes like a great tree in flower, sometimes like a white daffadowndilly, small and slender like. Hard as di'monds, soft as moonlight. Warm as sunlight, cold as frost in the stars. Proud and far-off as a snow-mountain, and as merry as any lass I ever saw with daisies in her hair in springtime." 26. "The snow leopard is absolutely magnificent. It represents really what endangered species are all about." 27. "As Beck drove out of the garage, he gave the parking attendants a big toothy smile and a wave. "There's some snow on the fifth level. Thought ya might like to know. Y'all have a nice day, now!" he called out.No wonder Dad liked working with you." 28. "Then she says, ‘I love you.' Like three drops of blood falling onto snow." 29. "She came right up to me and put her snow-white hand on my arm. "You poor boy," she murmured, "you poor boy." I'm not a boy, and I'm not poor, and I wished the hell she would get away. She has a clever face, but I felt in it, that night, the force of a great sadness and great malice. "I see a rope around your neck," she said sadly." 30. "Halt's heavy-shafted, long arrow was almost buried in its side, driven there by the full power of the Ranger's mighty longbow. He'd stuck the charging monster right behind the left shoulder, driving the head of the arrow into and through the pig's massive heart.A perfect shot.Halt reined in Abelard in a shower of snow and hurled himself to the ground, throwing his arms around the shaking boy. Will, overcome with relief, buried his face into the rough cloth of the Rang'ers cloak. He didn't want anyone to see the tears of relief that wer streaming down his face.Gently, Halt took the knife from WIll's hand. "What on earth where you hoping to do with this?" he asked." 31. "...winter crescent resting in the high pine bough - you fly through the woods like a lone snow bird..."
32. "Courtesies cannot be borrowed like snow shovels; you must have some of your own." 33. "Desolate city. Snow on the streets. Fire in the sky.It could have been one of a hundred wars.But there-The place on the street where the snow had melted. The dark crater in the sea of white.Daniel sank to his knees and reached for the ring of black ash stained on the ground.He closed his eyes.And he remembered the precise way she had died in his arms.Moscow.1941.So this was what she was doing-tunneling into her past lives. Hoping to understand.The thing was,there was no rhyme or reason to her deaths.More than anyone, Daniel knew that.But there were certain lifetimes when he'd tried to shed some light for her,hoping it would change things. Sometimes he'd hoped to keep her alive longer,though that never really worked. Sometimes-like this time during the siege of Moscow-he'd chosen to send her on her way more quickly.To spare her.So that his kiss could be the last thing she felt in that lifetime." 34. "We held hands when we walked down the gingerbread path into the forest, blood dripping from our fingers. We danced with witches and kissed monsters. We turned us into wintergirls, when she tried to leave, I pulled her back into the snow because I was afraid to be alone." 35. "Resting on your laurels is as dangerous as resting when you are walking in the snow. You doze off and die in your sleep." 36. "They snatched the girl off her tire swing in the backyard and dragged her into the woods; her body made a shallow track in the snow, from her world to mine. I saw it happen. I didn't stop it.It had been the longest, coldest winter of my life. Day after day under a pale, worthless sun. And the hunger- hunger that burned and gnawed, an insatiable master." 37. "Do not stand at my grave and weep, I am not there, I do not sleep. I am in a thousand winds that blow, I am the softly falling snow. I am the gentle showers of rain, I am the fields of ripening grain. I am in the morning hush, I am in the graceful rush Of beautiful birds in circling flight, I am the starshine of the night. I am in the flowers that bloom, I am in a quiet room. I am in the birds that sing, I am in each lovely thing. Do not stand at my grave bereft I am not there. I have not left." 38. "Vodka goes well with a wintery perspective. Nothing else provokes such presentiments of falling snow except, for some, the communist seizure of the state." 39. "I didn't blame Wes. I actually didn't blame anybody except myself. Really, what did I have in my life that was so bad it raced under my skin until I couldn't stand it anymore and I had to give it a place to come out? I didn't know. At moments like this, when my flesh cried out for relief, I didn't have to know. I just needed to make it stop. I lifted the pleated bed skirt and pulled out the wooden box. Inside, the instruments were lines up on a folded snowy white pillowcase, still sterile and gleaming from Eater night." 40. "The Worldly Hope men set their Hearts upon Turns Ashes--or it prospers; and anon, Like Snow upon the Desert's dusty Face Lighting a little Hour or two--is gone." 41. "My skin's too white." she said.Says who, Snow White?" he said, touching her cheek lightly with one hand." 42. "I breathe in the soft, saturated exhalations of cedar trees and salmonberry bushes, fireweed and wood fern, marsh hawks and meadow voles, marten and harbor seal and blacktail deer. I breathe in the same particles of air that made songs in the throats of hermit thrushes and gave voices to humpback whales, the same particles of air that lifted the wings of bald eagles and buzzed in the flight of hummingbirds, the same particles of air that rushed over the sea in storms, whirled in high mountain snows, whistled across the poles, and whispered through lush equatorial gardens…air that has passed continually through life on earth. I breathe it in, pass it on, share it in equal measure with billions of other living things, endlessly, infinitely." 43. "Advice is like snow - the softer it falls, the longer it dwells upon, and the deeper in sinks into the mind." 44. "Saving Edward Snowden from prison is one of WikiLeaks' achievements of which I am most proud." 45. "We all started snowboarding in the beginning as a family just to be closer together, go on trips. It was our soccer, but instead of Dad yelling at me from the sideline he is there riding with me and hitting the jumps even before I am hitting them." 46. "Well, Lord Debonair and Lady Lethal, if we can have a minute of your time, we do have a psycho to hunt. (Allen)(Jess glared over his shoulder at Allen, but before he could comment, Syra shot another bolt from her crossbow. Allen went flying and landed flat on his back in the snow. Syra walked over to him and stared down. )I don't particularly like Squires and I really hate the Blood Rites. So save yourself some pain and don't speak to me again. (Syra)"
47. "It seemed more and more like something out of a children's book - the butterfly that followed the little girl all the way home to her fifth-floor walk-up. How above-the-law children's books are. Hansel and Gretel (littering, breaking and entering), Rumpelstiltskin (forced labor), Snow White (conspiracy to commit murder), Rapunzel (breach of contract)." 48. "Near the snow,near the sun , in the highest fieldSee how those names are feted by the wavering grass,And by the streamers of white cloud,And whispers of wind in the listening sky;The names of those who in their lives have fought for life,Who wore at their hearts the fire's centre.Born of the sun they traveled a short while towrads the sun.And left the vivid air signed with their honour." 49. "To be ultra is to go beyond. is to attack the scepter in the name of the throne, and the miter in the name of the alter; it is to mistreat the thing you support; it is to kick in the traces; is is to cavil at the stake for undercooking heretics; it is to reproach the idol for lack of idolatry; it is to insult through an excess of respect; it is to find to little papistry in the pope; in the king to little royalty, and too much light in the night; it is to be dissatisfied with the albatross, with snow ,with the swan, and the lily for not being white enough; it is to champion things to the point of becoming their enemy, it is to become so pro you become con." Improvement is not enough, you also needs innovation." Who Was Talking About "Snow"?